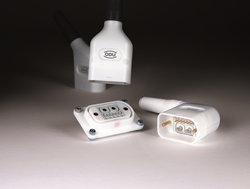 ODU, a worldwide leader in designing and manufacturing high performance connectors, is now promoting to the US market its advanced ODU-MAC® ZERO modular rectangular connector solution designed for a wide range of medical, industrial electronics and measurement and testing applications. Compact and flexible: The ODU-MAC® ZERO is a versatile hybrid connector with plastic housing, it has an ergonomic design and up to 60,000 mating cycles durability. This new connector solution can fit up to 90 connection points and 18 module types including modules for signal, power, coax, fiber optic, high speed, lens connector for POF, and an 8 channel module for a coax option. Other product features include: three different outlets (straight, 45° and 90°), lightweight, available in a non-magnetic version, easy to clean, 7 color coding options for the bend relief and all touchable parts are nickel free. The easy handling is ensured through low mating and demating forces as well as per-module coding options or color-coded cable bend reliefs. The connector's snap-in locking with break-­away function ensures a quick emergency release of the connection. By choosing the right modules, ODU-MAC® ZERO is also a perfect solution for non-magnetic applications. ODU-USA provides also advanced cable assembly integrated solutions.